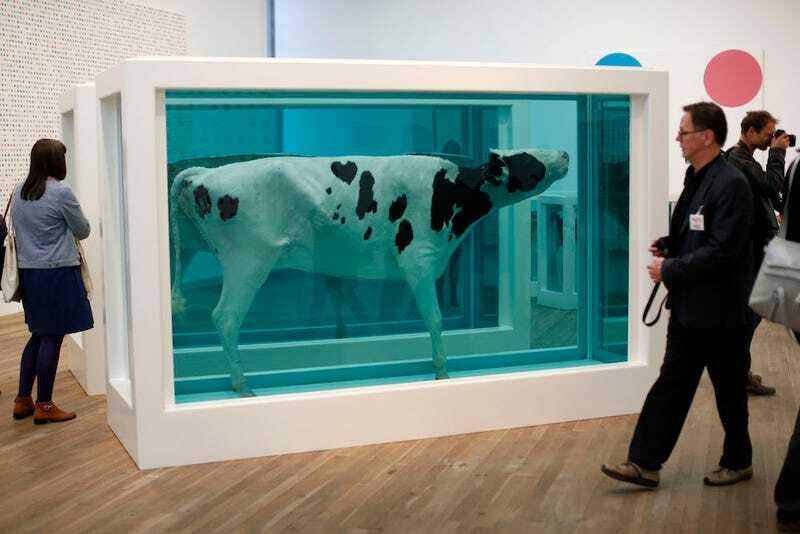 In the early 1990s artist Damien Hirst became famous for a series of works featuring dead animals swimming in tanks of formaldehyde. Now a group of chemists claim they have found troubling levels of formaldehyde gas—a known carcinogen—around these publicly displayed artworks. While your first association with formaldehyde is probably from the jars of animal specimens you encountered in 7th-grade biology class, it’s important to note that formaldehyde is all around us. Furniture and other construction materials are made with the chemical. But sometimes formaldehyde gas can be released from these objects—known as “off-gassing”—which can cause nosebleeds and coughing, and, in the long-term, nose and mouth cancer. In this case, the formaldehyde fumes were likely escaping the tanks via the sealant, which had to be reapplied over the years to prevent the liquid from leaking. But it’s not the public that the scientists are worried about. Study author Pier Giorgio Righetti told the New York Times that he believed visitors were not exposed to the formaldehyde gas for long enough period to suffer any adverse effects, but he could not say the same for museum staff, who are often in close quarters with these works in poorly ventilated conditions. What makes this entire thing so ironic is that this is an artist who is known for his fascination with health, as evidenced from his Pharmacy series— which can now be experienced in a new pill-themed restaurant in London—to the name of his company (“Science Ltd.”). So maybe the gas leak is all part of the art?